Came in a Mark IVa. Red dot on the tubes. No label on the base, just on the glass. One tube broke. Are these tubes worth keeping? How do they compare to the current Mesa 6L6 offering? Should I try to hunt down a single/pair of Red Dot Mesa Str420 Coke Bottles to complete a quad? Re: Mesa STR420 "Coke Bottle"
they are shuguang 6L6/5881 tubes. No different than the straight glass tubes. I like them, they are no longer produced. I would not waste a lot of time looking for replacements. I actually loved those tubes. A bit different than the stuff produced now. I had them in my Mark IVb for a good 12 years. I did not play regularly due to an injury 4 years after I got the amp. Now that I am back into it, things have changed since then. The Coke bottle 6L6 tubes also had a pair of getters closer to the pins on the tube and not in the usual location like at the top or bulb end. 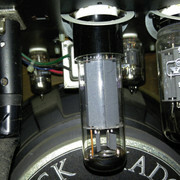 The other Mesa tubes are good too which is what I have been using since 2012 among other power tubes. I have a few pairs from years ago that I've been using as backups, mainly because the current ones haven't blown. If you look on the Bay, you can find them. There's a guy that always has them in stock. $31.99 plus shipping for a quad. Will see how they work out. I looked at the site, matched and tested but to what spec? Have you bought these before? bandit2013 wrote: I looked at the site, matched and tested but to what spec? Have you bought these before? You could send the guy a message and ask him. He used to show the test results in the pics, but I think he started doing some decent numbers and it's probably time consuming. I have a quad of coke bottle from this seller. I split them into pairs and use them in my 5150 combo and have used them in my gigging Mark IV as centers. I got my quad today (fast shipping and well packaged) and after letting them set inside my house to get to room temperature for a couple hours (it has been like 30 below wind chill here), I fired them up. Can't say there was any huge difference from the MESA STR 440 set that was in, but what I noticed I liked. I think they sounded ever so slightly darker and thicker. Maybe a little warmer overall in a good way. I assume they may have some break in period. Ran them in 90 watt mode, then 45, then 10 watts. All sounded good, but it sounded good before. It was pretty juicy in Tweed mode on 10 watts and very creamy in Mark I mode. All three CH 3 modes had a little more low end and were a tad warmer. I like them and for $31 for a quad they are a heckuva product if they last for awhile. I'm waiting on a quad of bottles, too. You can't beat the price. I alternate between a set bottles and a set of Sovtek 5881s. I switch/combine them in the summer when the outdoor gigs start. I understand what you mean when you say the amp sounded good before and after. My MKIV is the same way. I don't think I've ever put in a set of power tubes that made a HUGE tonal difference in the Mark. At least nothing the audience would notice.